Free Download. Drawing on the work of Gayle MacDonald and Dawn Nelson, Tracy Walton developed a 5-level massage therapy pressure scale for use in massage therapy, oncology massage therapy, and hospital-based massage therapy. It is a great tool for communicating with medical care providers and clients about massage pressure. As long as you retain the credits and reference the author, you may download and reprint the file for free here: Walton Pressure Scale. 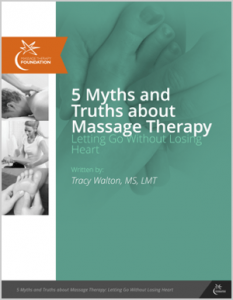 Walton, T. (Free Download) Five Myths and Truths about Massage Therapy: Letting Go without Losing Heart. Evanston, IL: Massage Therapy Foundation, 2016. Walton, T. Medical Conditions and Massage Therapy: A Decision Tree Approach. Philadelphia: Lippincott Williams & Wilkins/Wolters Kluwer Health, 2011. Available in English, Spanish, Cantonese, and Mandarin. Walton T. Choosing Our Words Wisely-Language Matters Massage Today June 2018;18(6). Walton T. Could Massage Spread Cancer in the Newly Diagnosed? Massage Today Jan 2018;18(1). Walton T. Does Massage Spread Cancer? An Update Massage Today Sep 2017;17(10). Walton T. When Cancer Involves the Brain (Part 2) Massage Today Mar 2017;17(3). Walton T. When Cancer Involves the Brain (Part 1) Massage Today Feb 2017;17(2). Walton T. Paying it Forward The Touch of Kindness Fund for Oncology Massage Massage Today Aug 2016;16(8). Walton T. Telling the Truth About Massage Therapy Massage Today Mar 2016;16(3). Walton T. Compassion and Compassion Fatigue: Balancing Your Emotions in the Treatment Room Massage Today May 2015;15(5). Walton T. When Cancer Involves the Liver Massage Today Feb 2015;15(2). Walton T. In Oncology Massage, Positioning Matters Massage Today Sept 2014;14(9). Walton T. “Selling” Gentle Massage to Clients with Cancer. Massage Today Feb 2014;14(2). Walton T. The author’s path. Massage & Bodywork May/June 2011:40-9. Walton T. Massage for caregivers. Massage Today April 2008; (4). Myers C, Walton T, Bratsman L, Wilson J, Small B. Massage modalities and symptoms reported by cancer patients: narrative review. Journal of the Society for Integrative Oncology Winter 2008;6(1):19-28. Walton T. The first oncology massage healing summit. Massage Today Aug 2007;7(8):8. Walton T. Meeting the emotional challenges of oncology massage. Massage Today June 2007;7(6):16-17. Walton T. Learning from the largest study on cancer and massage. Massage Today Feb 2007;7(2):6-7. Walton, T. Cancer and massage therapy: contraindications and cancer treatment. Massage Therapy Journal Fall 2006;45(3):119-135. Walton T. Developments in oncology massage. Massage Today Aug 2006;6(8):7,23. Walton, T. Cancer and massage therapy: essential contraindications.Massage Therapy Journal Summer 2006;45(2):119-135. Walton T. A study on massage and symptom relief. Massage Today May 2006;6(5):6,15. Walton T. Medical conditions in massage practice, part III: interviewing for medications. Massage Today Aug 2005;5(8):1,8. Walton T. Medical conditions in massage practice, part II: the client in a physician’s care. Massage Today July 2005;5(7):1,6. Walton T. Medical conditions in massage practice: intake forms and questions, part I. Massage Today June 2005;5(6):1,7. Toth M, Kahn J, Walton T, Hrbek A, Eisenberg DM, Phillips RS. Therapeutic Massage Intervention for Hospitalized Patients with Cancer—a Pilot Study. Alternative and Complementary Therapies June 2003:117-124. Walton, T. In Review: Massage Therapy Guidelines for Hospital and Home Care (Book Review). Massage Magazine Nov/Dec 2001;94:148-149. Walton, T. Contraindications to massage part IV: clinical thinking and cancer. Massage Therapy Journal Fall 2000;39(3):66-83. Werner R, Walton T, Benjamin B. Hygienic methods for massage therapists. Massage Therapy Journal Winter 1999;37(4):24-31. Walton T. Contraindications to massage part III: communicating with a client’s clinician. Massage Therapy Journal Fall 1999;38(3):40-48. Walton T. Contraindiations to massage part II: taking a health history. Massage Therapy Journal Winter 1999;37(4):70-92. Walton T.Contraindications to massage part I: roadblocks on the way to consensus.Massage Therapy Journal Summer 1998;37(2):108-112. Benjamin B, Walton T. The benefits and risks of bodywork. Massage Therapy Journal Spring 1998;37(1):23-25. > > see further journal articles, texts and searchable databases on massage therapy.